Fifty-two members of Congress across the ideological spectrum are asking the Justice Department not to eliminate 6,000 jobs, imploring officials to reconsider a recent mandate to eliminate the positions. The lawmakers said the the Bureau of Prisons should not cut the thousands of vacancies at federal facilities nationwide, noting they were only unfilled because the agency has not lifted the hiring freeze President Trump issued on a governmentwide basis in January 2017 and ended a few months later. The decision would threaten the “safety of our correctional officers and the security of prisons,” the lawmakers said in their letter to Attorney General Jeff Sessions. The mandate to cut the jobs was first reported by Government Executive in January. Justice issued the call while seeking to identify more inmates to transfer to private contract facilities. Last year, Sessions issued guidance that reversed an Obama administration policy to phase out the use of private prisons. In their letter, the lawmakers noted that Justice “recently” instructed the bureau to eliminate the 6,000 positions. They noted that some facilities began using a process called “augmentation,” in which non-correction officers are reassigned from their normal work into guard duties. Such a strategy, they said, has resulted in staff falling behind on the tasks they were hired to perform. Work performed by teachers, counselors and trade workers at federal prisons is falling by the wayside, which the lawmakers said has created “even more pressure in an already dangerous setting.” It has also led to accelerated burnout and lower morale, further exacerbating staffing shortages. Reduced staff levels create higher threat levels in emergency situations, the bipartisan group said, an issue made worse by the other cuts taking place due to augmentation. “This is especially problematic when considering the potential unrest that may occur due to subsequent loss of inmate programming and services,” they said, adding that historically inmates are more prone to violence when those cuts take place. Nancy Ayers, a bureau spokeswoman, said augmentation is a longstanding practice and the agency understands the associated concerns. She added that “the safety of staff, inmates, and the public is the highest priority for the BOP.” Ayers also noted that no employees would be displaced or face layoffs, and that Sessions would respond to lawmakers directly. Coupled with the decision to boost inmates held in contracted facilities, the job reductions are seen as part of a wider effort by the Trump administration to shift more of the burden of running the federal prison system to the private sector. In 2016, former Deputy Attorney General Sally Yates issued a memo instructing the bureau to either end private facility contracts when their terms expired or “substantially reduce [their] scope” to correspond with declining inmate populations. 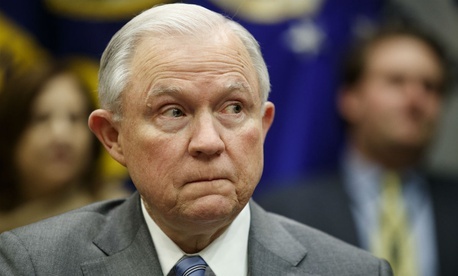 Sessions said in February 2017 that Yates' decision “changed long-standing policy” of the bureau and impaired its “ability to meet the future needs of the federal correctional system.” The federal inmate population has dropped by about 36,000 since 2013, according to Bureau of Prisons statistics, a 16 percent reduction. This story has been updated with comment from the Bureau of Prisons.